Thanks for coming 'down south'! Submitted by abroca on Mon, 12/28/2009 - 10:54. Just about anything you would want to add (and eat) can be put in these. Also, sugar content can be adjusted depending on who you are making them for. I brought these to Christmas Eve this year, and made them desserty-sweet. Submitted by admin on Wed, 12/16/2009 - 20:50.
helps. And of course, feel free to spread the word around the family. Submitted by eddiebeale on Sun, 10/18/2009 - 13:49. Submitted by eddiebeale on Mon, 10/12/2009 - 08:08. Michelle and I really appreciated everyone who ventured south to our place this past Saturday. It was nice to mark the milestone with all our family and friends. 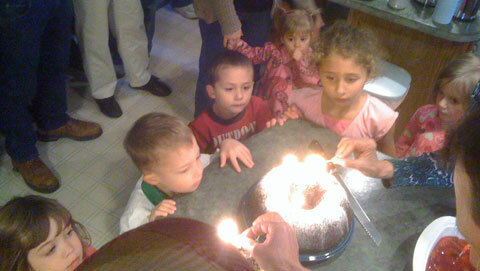 We hope everyone enjoyed the food from Paul's Pasta in Groton, and of course the "tunnel of fudge" birthday cake! Submitted by wbeale on Sun, 10/11/2009 - 21:12. Enjoying fall with family and friends is one of the most pleasant things to do and this weekend was nothing short of landmark in that regard. To start the games off we had a great gathering at the "Oakdale Beales'" place to celebrate Michelle's 40th Birthday on Saturday and boy was it a celebration indeed! Submitted by abroca on Sun, 09/13/2009 - 07:52. One committee I am on for work is Celebrating Agriculture. The evevnt is focused on promoting local agriculture! It a very fun day with animals, a hayride through one of the Farmer's Cow barns, quilts, spinners, farmers market, kids activities, etc. I am in charge of kids crafts. It's free and at the Woodstock Fair grounds on September 26. www.celebratingagriculture.org is the website. Submitted by wbeale on Wed, 09/02/2009 - 10:24. Friday, August 28th was Shayla's meet-and-greet and orientation for her pre-k class. 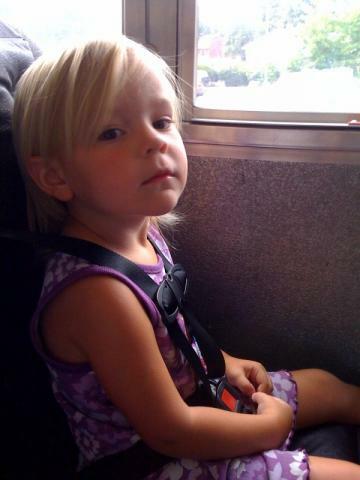 She was able to ride the bus for the first time and check out her new environment. Afterward, we crossed the Connecticut river via the Glastonbury-Rockyhill ferry to enjoy an impromptu lunch with mom...all told, a relaxing daddy/daughter day to round out a busy and enjoyable summer! Submitted by Michelle on Mon, 08/31/2009 - 05:22. I'll be starting the clinical trial on September 1st! We are off to Boston for the week Tuesday morning for my first proton radiation session. I hope they let Ed take a picture once I'm all strapped in so I can post it. Wish me luck. I have to go for 30 business days in a row. Submitted by eddiebeale on Wed, 08/12/2009 - 17:30. Here's an app partly developed by one of my co-workers. Use it to identify over 150 trees in North America. Submitted by Michelle on Sat, 08/01/2009 - 08:58. Help Michelle celebrate the fact she made it to 40! The party will be at our house because all the restaurants/halls are booked in the area due to the Coast Guard Academy's homecoming weekend. Hope to see you there! Your order from Amazon or iTunes will support this site at no additional cost to you. Just surf here *first* and click through to the sites *before* you start shopping! All content copyright ©2008, swishbrook.com and individual authors. All rights reserved.